You’ve got to make this dip! 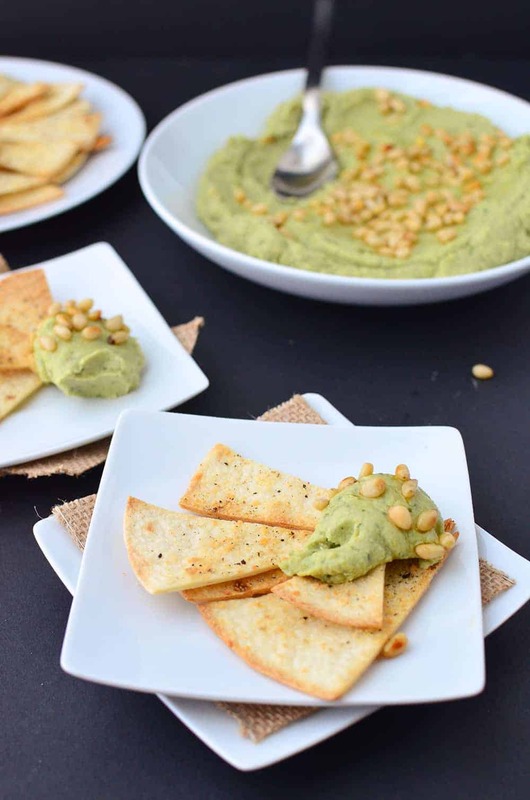 Avocado Pesto Hummus with homemade parmesan crisps. Perfect on sandwiches or as a dip. This dip was bound to happen at some point. 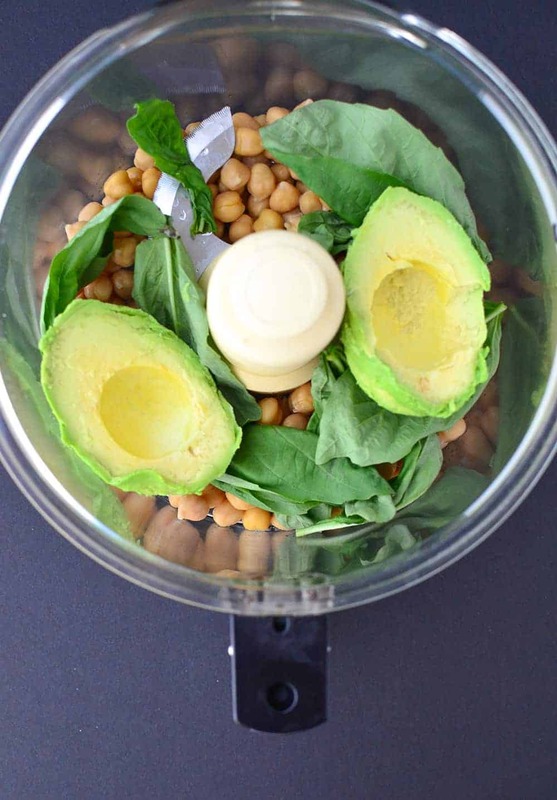 A trinity of my all-time favorite foods: avocado, pesto and hummus. Don’t make me pick a favorite! Because, I can’t. I know because whenever I go out for a sandwich and they ask me whether I want avocado, pesto or hummus on my vegetarian sub, I panic and ask for all three. Then, my simple veggie and bread sandwich costs me $10. How can you possibly choose between avocado, hummus or pesto? These are the decisions that keep me up at night. It’s not right, and with this spread, you don’t have to. It’s vegetarian gluttony in delicious, creamy perfection. 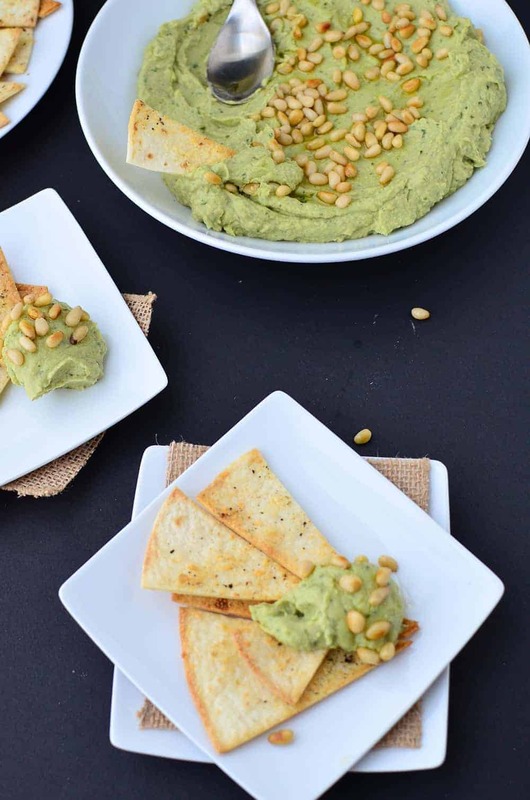 Even though I originally created this hummus to be tossed with hot pasta or lunch-time sandwiches, I loved the idea of creating a parmesan tortilla crisp to dip with. I know I’m a dietitian and should be telling you to scoop up your hummus with cucumber slices, carrot sticks or radishes. But, my carb-loving heart wants a crispy flat bread, not a vegetable. And since I eat my hummus like a full-course meal, I figure it’s appropriate. For my vegan friends, leave out the parm on the flatbreads and either leave plain or sprinkle with nutritional yeast. Since we are already using an entire avocado in the dip, I reduced the amount of olive oil I would normally add to hummus. I’ve found that you can easily skimp on added fats where you won’t miss them, and this dip is no exception. The avocado gives this hummus a silky, creamy texture. For an added WOW factor, I plate the hummus into a serving bowl and drizzle on a tsp. or two of olive oil. While this technique definitely adds more flavor, feel free to skip it. However, the pine nuts on top are a must. 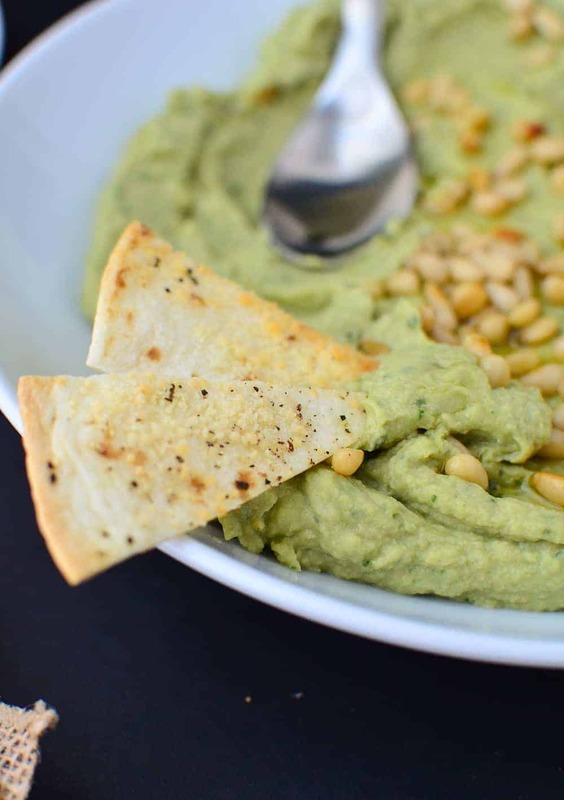 They bring the pesto flavor out, proving that this dip is much more than just avocado hummus. Preheat oven to 400 degrees F. In a food processor, pulse together garbanzo beans, basil, and garlic cloves with a pinch of salt and pepper. Add the avocado, lemon juice, 2 tbsp. olive oil and water. Puree until very smooth and creamy. 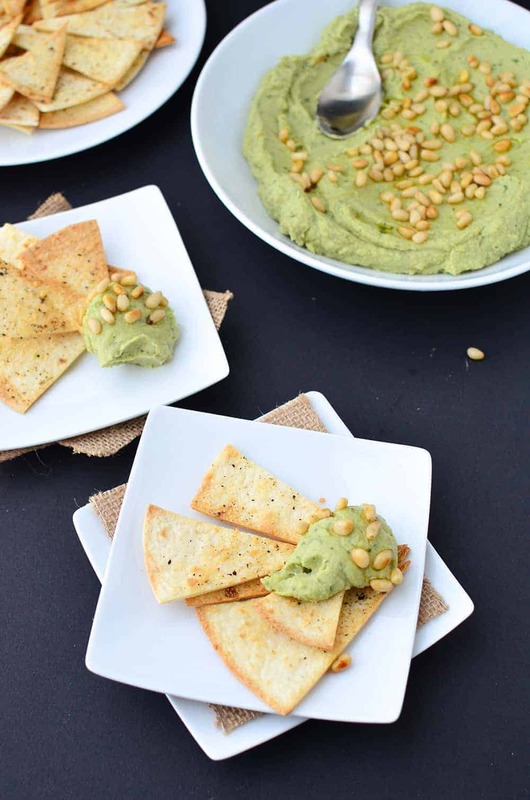 Remove the hummus and drizzle with olive oil and toasted pine nuts. Stack the tortillas and slice in 1/2. Stack those together and slice into 4 wedges. Remove and place on baking sheets in a single layer. Lightly spray with coconut oil or olive oil and sprinkle with ground pepper and parmesan cheese. Toast for 7-8 minutes until golden brown. Remove and serve with avocado pesto hummus. For vday this year the restaurant we went to had avocado hummus and I’ve been wanting to recreate it but you totally knocked it out of the park adding pesto- one of my other favs! Can’t wait to make this!!!! 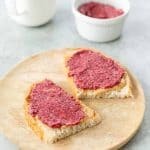 Loving this recipe. I’ve been on a total hummus kick lately! Yum!! Making homemade hummus has been on my list for awhile now, but I think I’ll just skip right ahead to this dip. It’s sounds delicious! Seriously, three of my favorite things all together! Seriously this has got to stop! I was set to make pesto this evening for the hubby (have to admit I am not a pesto fan) and saw I had an avocado that needed to be used stat. DK to the rescue with this dip! Thanks love! There are so many reasons we are friends. The same food preference is just one of them 🙂 PS- how can you not love pesto?! Oh my goodness this is like all my favorite things in one! Alex your recipe looks delicious. Pinning for menu planning. Thanks Jill! Hope you are well! 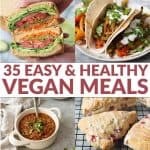 What a fantastic healthy idea! I’m going to have to try this!